16.9 kg. , 37.2 lbs. With my friends Dusty, Jen and my son John we headed down to the lake for a weekend with hopes of finding some nice striped bass. 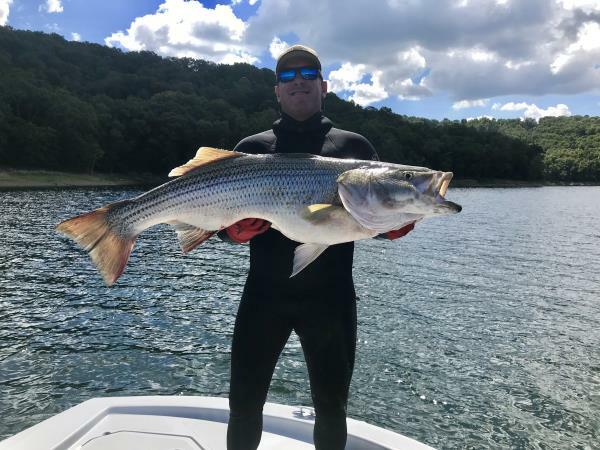 This summer has been truly magical for stripers down at the lake with most of our friends getting fish into the mid 30lb range. After getting a few of those myself my focus had changed and was really hoping to get a solid fish on polespear. That Saturday morning we went to one of our regular spots where there is some submerged timber and were marking some fish on our bottom finder so we suited up. Jen jumped in on one of the spots closer to shore and Dusty dropped me off about 75 yards away on another area he saw promise. After a couple of dives I hadn't seen any decent fish which I endicated to Dusty. He then suggested to move about 75' towards another mark he had just seen fish. About that time I hear Jen shout in excitement that she had gotten a nice fish! I was very excited for her to say the least since she's worked so hard for it this summer! After a moment of applause I refocus on my breathup to make the dive near the mark dusty had indicated and then took the dive making it down to 40' where I laid on the bottom with my polespear. Greated by great visibility for the lake I then began to immediately see a school of striped bass coming in close to check me out. At first some smaller fish but then a bit larger fish. I then loaded up my polespear which spooked the school slightly. However they circled back and with them was what appeared to be a much larger fish and it was within range. Without hesitation I let the spear fly hitting the striper just behind the gill plate. Fish took off like a missile and I headed for the surface. Right after I hit the surface I noticed the fish had completely spooled my belt reel and is began swimming as fast as possible the direction of the fish. After a couple mins the chase was over and I was able to get the fish by the gills, take a few in water pictures and then put the fish into the cooler. From there we headed immediately to Starkys marina where we were able to hang our certified scale and get measurements for not only my fish but for Jen's as well!